Last year, students from the Tokyo University of the Arts (TUA) Graduate School of Global Arts visited Taipei as part of a research exchange program between TUA and Taipei National University of the Arts (TNUA). They discussed the history of colonialism still observable in modern Taipei, its artistic and cultural scenes, museums and monuments. 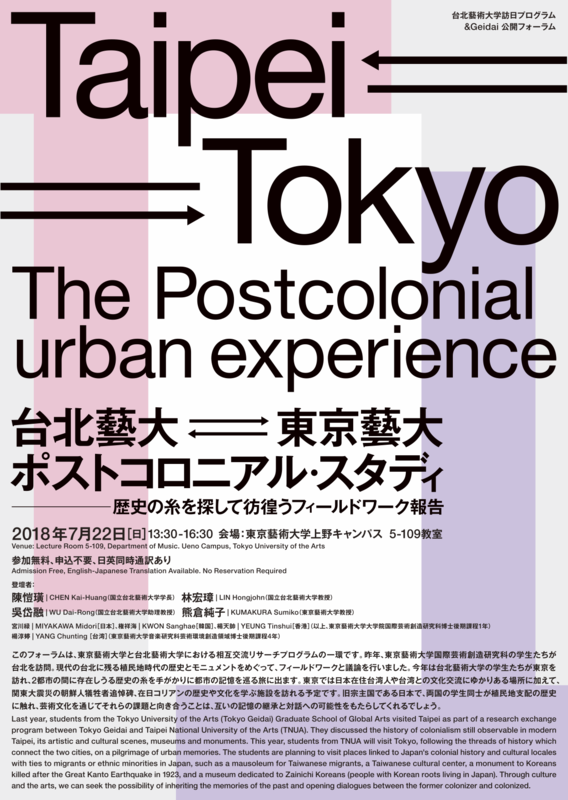 This year, students from TNUA will visit Tokyo, following the threads of history which connect the two cities, on a pilgrimage of urban memories. The students are planning to visit places linked to Japan’s colonial history and cultural locales with ties to migrants or ethnic minorities in Japan, such as a mausoleum for Taiwanese migrants, a Taiwanese cultural center, a monument to Koreans killed after the Great Kanto Earthquake in 1923, and a museum dedicated to Zainichi Koreans (people with Korean roots living in Japan). It is important that students from both countries come into contact with Japan’s colonial history, as it reminds us that this history is often the source of social and political issues in contemporary Japan. Through culture and the arts, we can seek the possibility of inheriting the memories of the past and opening dialogues between the former colonizer and colonized. 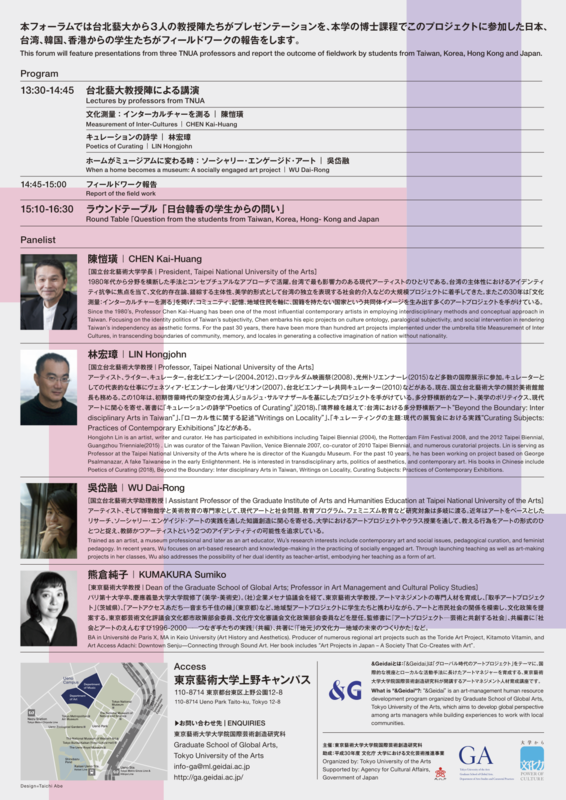 This forum will feature presentations from three TNUA professors and report the outcome of fieldwork by students from Taiwan, Korea, Hong Kong and Japan.